Pizza Sauce is one of the easiest Italian sauces to prepare at home. With just a few ingredients, you can have a flavourful sauce ready in about 30 to 40 minutes. Using canned tomatoes are a convinient option and you can use them, but I always prefer cooking with fresh ingredients. 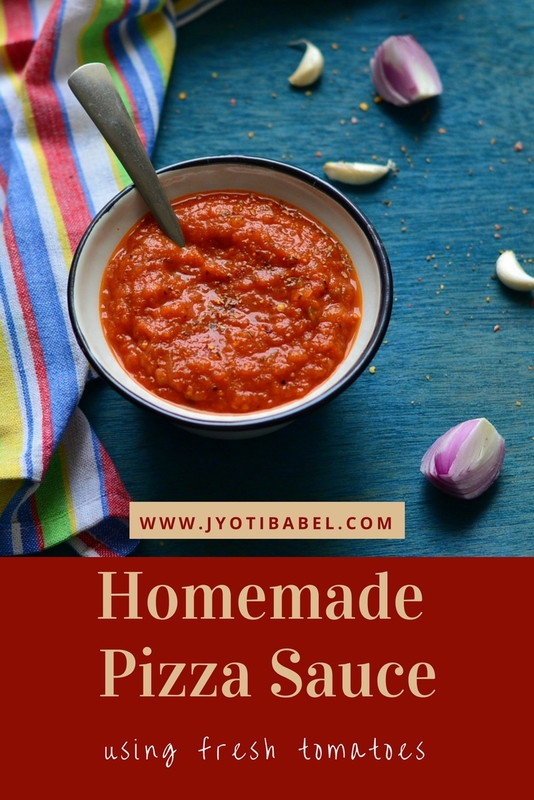 So, I am going to share my recipe for making pizza sauce using fresh tomatoes. Use ripe and red coloured tomatoes for best results. I ran out of fresh basil as I used all I had in making basil walnut pesto and hence used dried Italian seasoning mix to flavour it. 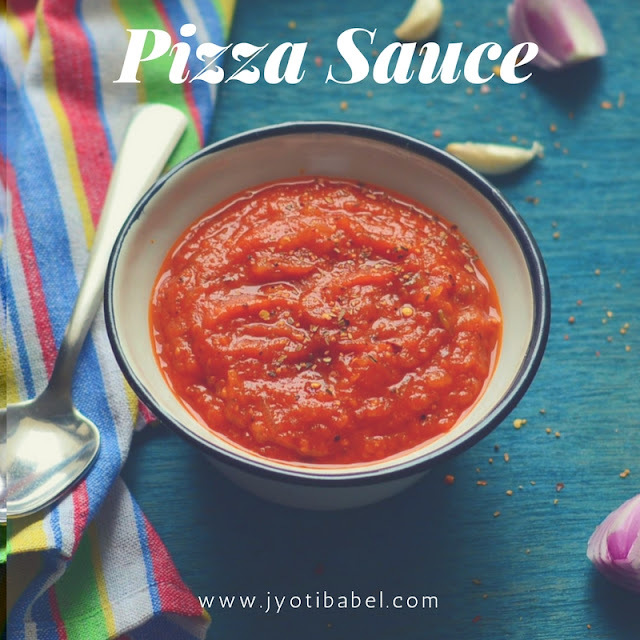 This pizza sauce is quite versatile - you can use it to spread over pizza made from scratch at home, you can also use it for making bread pizza and even pasta. It goes well with macaroni, fusilli and penne pasta. This recipe for pizza sauce can be doubled or tripled and you can freeze them in medium cubes for later use. When you have to use it, just thaw, reheat and use as needed. Let's now check out how I make homemade pizza sauce from scratch using fresh tomatoes. 1. Slit the bottom of the tomatoes in a cross. Boil enough water and submerge all the tomatoes in boiling water. 2. Keep them in boiling water for 2 minutes and then take them out. Once it is cool enough to handle peel the skin off the tomatoes and roughly chop them. 3. Puree the chopped tomatoes into a blender. Don't puree them too finely. 4. Heat the oil in a large pan. Add the chopped onion and garlic and sauté on a medium flame for 4-5 minutes. 5. When the onion start turning translucent, add the chopped capsicum and cook it covered on a medium flame for 3 to 4 minutes. Add the fresh tomato puree and salt and cook it for 15 minutes. Stir in between. The water content of the sauce will reduce by now. 6. Now add tomato ketchup, Italian seasoning mix and sugar. Stir well and cook on a medium flame for another7 to 10 minute. The pizza sauce should be thick by now and should coat the back of your spoon. 7. Take it off heat and let it cool completely. Once cooled you can store it in a glass jar and refrigerate it for later use. You can also use it immediately after cooling over pizza base. 1. I like to use tomato ketchup to the sauce as it imparts a perfect colour and flavour to the final sauce. 2. If you have fresh basil leaves, use 3-4 tbsp of finely chopped basil leaves to the sauce. 3. You can fresh the sauce in large ice-cube tray and then transfers the frozen cubes into zip lock pouches and use as needed. It will keep well for over a month. 4. This sauce can also be used with pasta like macaroni, fusilli and penne. This Homemade Pizza Sauce is my entry for BM 86 Week 3 Day #2 under the theme 'Italian Sauces You Should Master'. For Day #1 under the theme I had posted Basil Walnut Pesto. I love the homemade pasta/pizza sauce. Simple and fresh for sure. wow Pizza Sauce with fresh tomatoes look so yummy and better than the store bought.. Such flavorful sauce there jyothi, you have captured them so well..
Bookmarking this recipe to try soon . Homemade sauce is always better than the store bought one. Ingredient list is quite flavorful. It is so fresh and rich .. So much better than the store bought ones.. Lovely clicks..
How prefect and awesome this sauce looks, best and too good than the store bought ones. I simply love homemade pizza sauce. Wow adding green capsicum and ketch up sounds interesting and flavorful as well. Will try that next time. Thanks for the share. 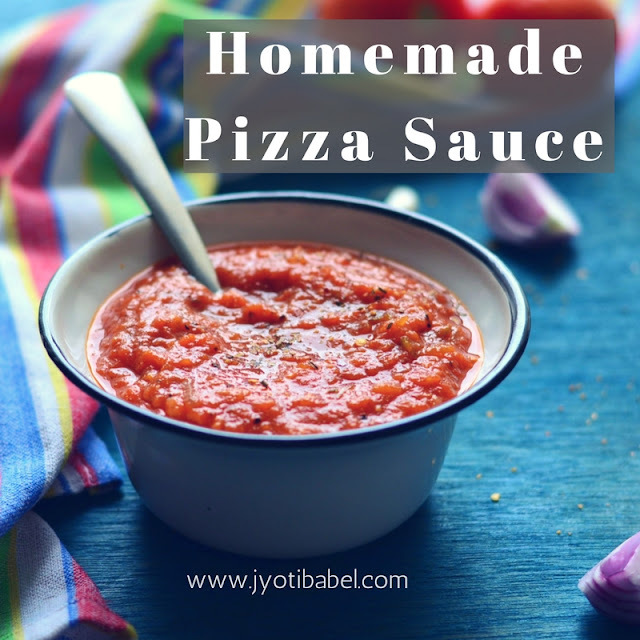 Homemade sauce are the best and nothing can beat the flavors of fresh tomatoes in pizza sauce. Lovely pictures Jyoti. 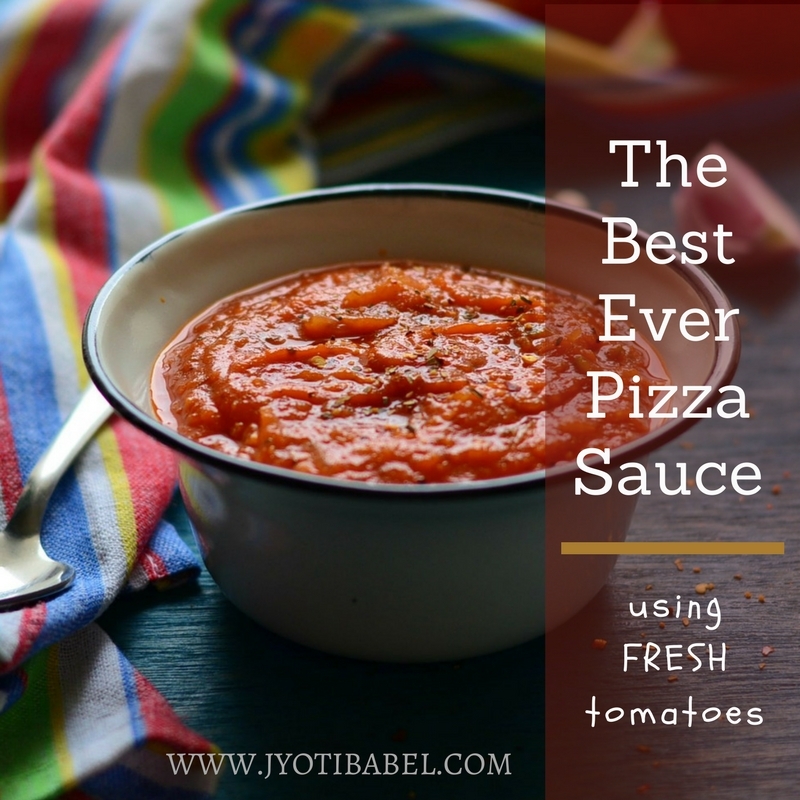 Love your version of this fresh and flavorful pizza sauce. Beautiful color. Homemade sauces are the best. Wow, what a striking color jyoti, looks tempting ! i love homemade sauces, such flavor and taste! Addition of ketchup and capsicum is very new to me, would love to try this one for our next pizza night! Beautiful pics dear! I love making these sauces at home and this is my go-to recipe too.